Good quality workmanship — Golly, many of these houses were well made. Mud-set tile… Steel kitchen cabinets… Gorgeous vintage lighting… lovely paneling… and more, in many houses. Yes, there may be some refreshing needed. There may be hazards such as lead and asbestos etc. and other not-to-today’s-code issues that you need to get educated on and invest in handling appropriately; consult with your own properly licensed professionals, for more info see our Be Safe / Renovate Safe page. And, there can be ugly surprise maintenance costs. But my sense is that new construction can have its own problems and even nightmares… and that in general, wonderfully crafted mid-century houses still exist by the hundreds of thousands — even by the millions. 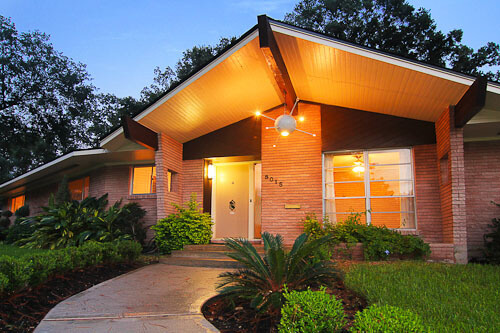 Price — Mid-century homes tend to be smaller than new construction. This is the first reason they may cost less than new or more recent constructed houses, which today average much larger than 50 years ago. In addition, the finishes used inside mid-century homes were typically not what the mainstream market today would consider high-end — no granite or marble or the like. That may put the brakes on their current sales price. And, because original features may read as “dated” to many buyers, the relative purchase price may be better, compared to new construction or to homes that have been “updated” <- now, there’s a word we are wary of here. Finally, even an old house that’s a “fixer upper” in need of repairs is more attractive to me and Kate — we don’t want to pay for someone else’s recent “upgrades” that we don’t like. We would rather get the house at a discounted price and take the chance that we can do the remodeling on budget in way more pleasing to our period tastes. All of these issues suggest you might be able to ‘get in cheaper’ versus buying a newer house. Of course the overall “better pricing” equation may not be true depending on the market you’re in — in many hip-to-the-vibe locations now, mid-century houses with their original features intact have become more desirable, with the trendiest architectural examples selling quickly. The new pink bathroom tile that Kate used in her bathroom remodel was under $5 per s.f. Read all the stories about Kate’s epic bathroom project here. Size and unpretentiousness = Long term affordability — In addition to costing less because it’s small, a smallish mid-century house will likely scale to require fewer expenditures happily ever after. Small can mean: (1) Less house to pay to maintain, (2) Less house to heat and air condition, (3) Less house to furnish, (4) Less house to pay taxes and insurance on, (5) Less house to clean. Kate adds that a ranch style house means (6) Easier to DIY roof repair$ and hou$e painting and $uch. All of this, by the way, means the less you will need to work to pay for it all. Also, the fact that the authentic period finishes on these house are not ‘fancy’ by today’s standards, means that materials required for restoration may be less costly. For mid-century houses we are talking: 4″ bathroom tiles… resilient flooring… plain cabinets… simple sinks and tubs… and many of these items can be purchased vintage, at ReStores and the like, for rock bottom prices. Peoples, I am telling you: Turn away from the siren song of keeping up with the Joneses and the everlasting gobstopper American marketing machine that works ceaselessly to burrow new-new-new-buy-buy-buy messages into our brains… keep the finishes in your mid-century house simple, which is architecturally appropriate anyway, and squirrel “the savings” into your retirement. Embodied energy — These houses already exist. Buy one — and as possible, practical and advisable, retain its original features — and you likely will be helping to avoid additional energy and natural resource use versus building or buying new. Of course, when it comes to energy and environmental features of our houses, each one will need to be assessed on its own; that said, I continue to find it impossible to mentally process the suggestion that we can consume our way out of a consumption process — that is: the implication of “build a green house!” and “buy this green product!” stories that imply that by abandoning our old housing stock in favor of building all-new “energy efficient” housing structures — or, by gutting existing houses and replacing still-functional stuff inside — we would be setting ourselves up for a better environmental future. I flat out find this impossible to believe; I need to see the calculus of how much carbon, water, forest, etc. this massive reworking of our housing stock would chew up.Waste distresses me, so I intensely favor buying existing houses: Use it up, wear it out, make it do (you can see this topic puts a heat-seeking-missile bee in my bonnet.) Note: At the end of January 2014, there were 1.9 million existing-built homes for sale in the U.S., the National Association of Realtors reported. The NAR considers this a 4.9-month supply, at the existing sales rate (which was slow in January), under the approximately six-month supply generally recommended. That said, there are now 10,000 Baby Boomers turning 65 daily. Additional houses will be heading our way soon enough…. If you are really really really lucky, you’ll score a time capsule house with its own bowling alley in the basement. Great architecture and features — Mid-century America was a period of immense innovation. Merchant builders built houses that were stylin’. My sense is that there were lots more major manufacturers in the marketplace supplying products, so there was a lot of competition, which meant a lot of proud invention — amazing stoves! sparkle laminate! cork floors! amazing tile! Homeowners did wicked awesome things like build tiki bars in their basements. And again, quality of workmanship was often wonderful. All this adds up to discovering many wonderful features in mid-century houses. There was interesting design, outside and in. Another thing we Retro Renovators have in common, I’ve typically found, is that we are highly visual. 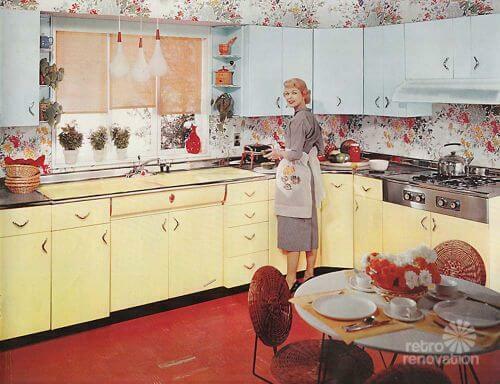 Once we own or live in a mid-century home, we can easily become fascinated by the aesthetics of the period. That said: All design is highly visual, so I think you could be a highly visual person and be into any interior design style. 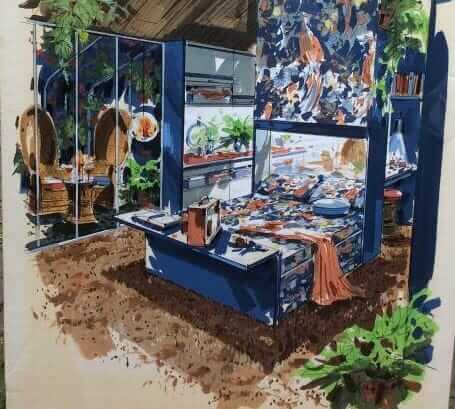 But I think that our highly visual nature, combined with all the other factors on this list, make the mid-century period a particularly appealing one for us. 1946 Merillat kitchen that was built by the company’s owner and his wife, by hand, for one of their first employees. Now in the company archives. Warm fuzzies — Our definition of mid-century houses includes both “mid-century modern” and “mid-century modest.” Interestingly, while “moderns” and “modests” may have been designed to look very different on the outside, on the inside they often shared many many design features — namely, use of unpretentious materials, interesting design features, and similar pastel bathrooms and colorful kitchens. Mid-century modern houses: Hard not to get gaga over the fabulous lines of these houses. Add color, and they are so fun. Mid-century modest houses: These can be so00000 cozy. The ceilings are not super high. The homes envelop us. America is such a mobile country — so many of us needed to move for jobs — our roots may be far away. We love our mobility, but hey, we miss our kinfolk, too… and the cozy features within our mid-century houses remind us of our Grandma’s house. My grandma had a kitchen full of knotty pine galore, a den with a wall full of family photos, and bathrooms with sunny tile. Happy happy memories, easy to channel if you own a mid-century house. 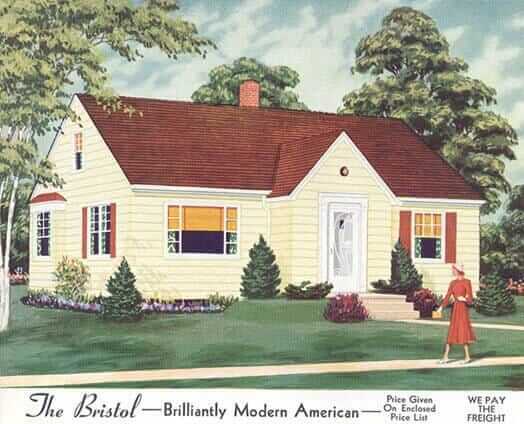 “Modern” living — My sense is that for the mass of America prior to World War II, it was a hard-knock life. But the economy boomed after World War II. 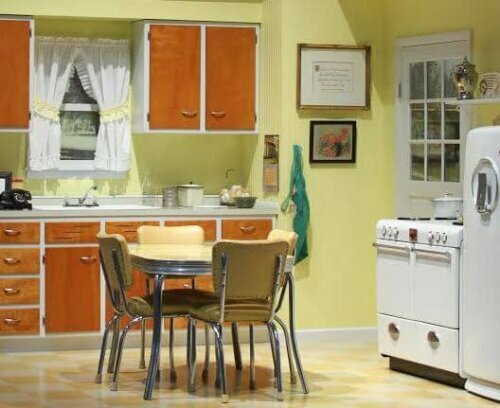 And houses from that point on began bringing all kinds of “modern” amenities to the largest generation of families ever… Modern conveniences like: electricity, indoor bathroom plumbing, central heating [and with it, larger windows], “fitted kitchens”, larger flowing rooms, and more. Today, all these same features continue to comprise the fundamental requirements for contemporary homes. Not a lot has really changed. Today, homes need better amperage… windows are double-paned (although not likely made better)… the materials we use to build homes or fit them out may differ… ya got yer low-flow toilets and Energy Star appliances (again, likely not made with as much quality as back in the day)… and certainly many superficial “fashion” choices may be different. But even if you live in a mid-century house that is 50 years old, you are likely living in a house that still is almost entirely suitable to contemporary 21st century living. Hey: Because a mid-century house may be smaller and cost less to purchase and maintain, it may be MORE suited to 21st century living, if you are concerned about climate change and having the money — in a less stable economic and jobs environment — to maintain it and even to hold on to it. Read this story from 2009 — I explored whether, s.f. per s.f., was this the best ranch house plan yet. Floor plan: Mid-century houses often were ranch-style houses or Cape Cods with bedrooms on the ground level. Single-story ranch houses, in particular, are great for aging in place. Having lived in several styles of homes, I would go a step beyond and say that ranches — with those bedrooms close at hand and nice circulation and flow — are more livable for virtually anyone and everyone — although I do miss all the exercise I got going up and down stairs 800 times a day when I lived in two-story houses. Sort of. Note, I do acknowledge: Ranch style houses require larger lots – and obviously, the larger and more sprawling the home is, the more land will be required; my understanding is that building up, if you need space, is more economical along a number of dimensions. Heck to the yeah to the Sputnik house! They’re hip(ish) — When I started this blog in 2007, there already was a market for mid-century modern houses — the architect-designed confections, with impractical roof lines, especially on the West Coast. In the six+ years since, interest in these mid-century modern houses has really exploded. Meanwhile, flash back to 2007 and mid-century modest houses were not much on the fashcionista radar, they were disparaged, even. 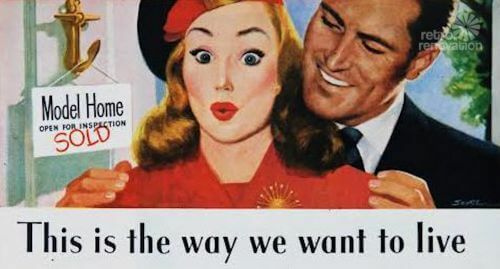 But then came Mad Men (Betty had a knotty pine kitchen) … and in general, 50 years passed and there was a new generation of buyers without any baggage…. and all the kids are wearing retro anyway… and more Baby Boomers were retiring, and they were nostalgic and downsizing and wanting ranch houses… and there was a Great Recession, and small, affordable houses were sort of appealing again… and I’ll even suggest there was the internet, including this blog, connecting folks to mid-mod alternatives and resources… and before you knew it, the world began to see the charm of the simple tract house. Today, there’s much more interest in mid-century houses — modern and modest alike — with lots of readers telling me that they are searching for old houses from the era to call their own. Anne Taintor January 2014 caption contest winner Robert Wooldridge. Neighbors from the way-back days — Live in a mid-century neighborhood, and chances are there are original owners in their original houses nearby. Theirs may be the last generation in America not to move nine times (or whatever) because of job changes. 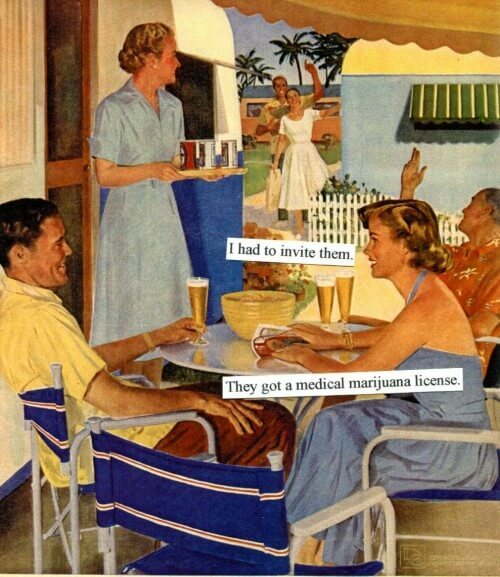 It’s so nice to have some grandma and grandpa-aged neighbors around, to tell us what the place looked like from the start, don’t you think? Remember Gabe & Amanda’s stunning mid-century modern house? 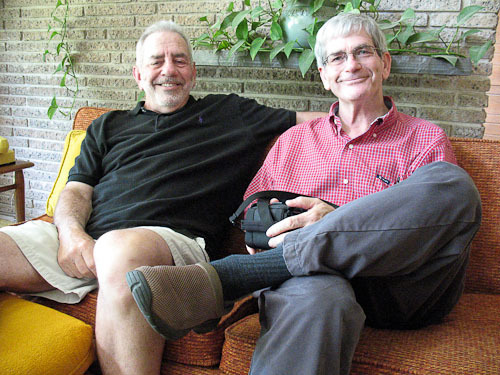 Sons (above) of the original owners came to visit and share stories about their childhood home. The stories — This one is related to #11 … and is one of my favorite “unexpected surprises” about the joy of owning a mid-century house: There are folks still around who can tell us first-hand stories about our homes, including who built them, who lived there and why. I am sure there are wonderful stories about Victorian and Arts ‘n Crafts houses, etc., too. But we can longer hear those stories first-hand, and there likely aren’t many photos. Readers with mid-century houses, on the other hand, report experience after experience of meeting the original owners, or their children, of their houses. 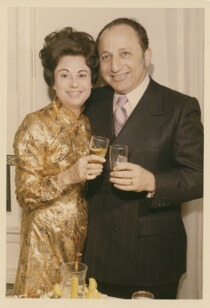 The original owners share information and stories and photos and architectural drawings…. In my house, the grown child of early, longtime owners showed me where he stashed his teenaged Marlboros (they are still in their hiding place; he searched; yes, they were there, and then we put them back – a little time capsule.) He showed me where his beloved boyhood dog chewed the door molding at the top of the basement stairs — and I now treasure that boo boo. He showed me where the dog was buried in the backyard. His mother sent me photos taken in the house in the 1950s — weddings, Christmas, the original kitchen…. It’s all so heartwarming, I could bust. I am just the latest caretaker of this treasure of a house. Which there are oh-so many reasons to love. What do you think, dear readers: Did I capture the big reasons we love our mid-century houses? And for sure: I would love to hear — in great detail — yes! — the exact reasons that you chose your home! Tip: If you do want to write a long answer, write it out in Word first, then cut and paste it into a Comment. In case something goes wrong, I don’t want you to lose your thoughtful work! I inherited my folks 1969 ranch. It is the perfect retirement home: one floor, open concept kitchen and family room, takes less time to clean, brick. We have insulated it and have great low energy costs. Pam, you really have got this right. I think the reason it took you so long to come up with the list is that you’ve been discovering over time WHY you like certain features of mid-century houses and WHY your readers do. It is in entering this conversation that I have come up with a very similar set of loveable features of our houses. Like many of you, my DH and I walked into my ranch house and fell in love with it, not fully realizing why. (Well, he fell in love with the outside before we even called the realtor to see it.) It didn’t meet all of the requirements we had, but it was very adaptable, and we ended up being able to add everything we wanted and really needed. I do think you left a few somethings out of your list that might be subsets of one or more of the 12 main reasons. 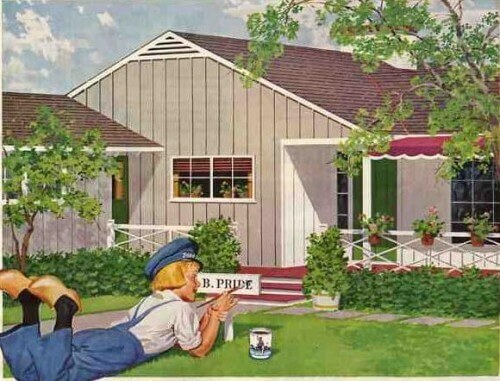 Besides being easy to refurbish on the cheap, the mid-century houses were DESIGNED to be starter houses that could be added onto. It was assumed that a growing family with a two- or three-bedroom ranch would want to built on an addition with another bedroom, family room or dining room, a larger front porch or deck in the back, a second bath, a roof dormer, etc. If you go into one of the Levittown communites, you will drive down the street and it will be difficult to tell what the houses originally looked like, because owners over the years have added so many features and individualized their homes. In addition, many built-in bookshelves, cabinets, etc. were added by owners after they had lived in the basic house for a while. Another plus is a subset of both the cozy vibe and the ease and low expense of maintaining a mid-century home. I discovered when I moved from a late 20th-century condo to my 1959 ranch that room for possessions was way scaled down in the new place and that I had to scale down on the amount of stuff I was moving in. There was no coat closet, so we had to figure out where to put our coats and get rid of extras. The linen closet and the bedroom closets were each about 1/3 the size of the ones we had filled up in our old place. This is the last part of the old Yankee proverb you quoted: “Use it up, wear it out, make it do, . . .do without.” Do you remember the explosion of shopping mall building in the 1980s? There are so many things we were conditioned to think we needed–a machine that does nothing but cook hot dogs and one that does nothing but cut French fries, really? We needed those? Living in a mid-century house teaches me about the things I can do without, like three sets of sheets for each bed and six sets of towels for each bath. There is plenty of room in an 1100 to 1900 square-foot house for what a family needs. There just isn’t room for stuff we don’t need. Every time I buy something now, I am conscious of where it is going and what I have to move out of that space to make room for it. 1) To match my furniture. It sounds crazy to buy a house to match the furniture you already have, but I collect beautiful, 1950s Drexel Counterpoint furniture and other Mid Century pieces and they are very much a part of me and my aesthetic. They wouldn’t ‘suit’ a more modern house. 2) I grew up in a 1963, Mid Century home. I grew up with a Mamie Pink Bathroom, brightly colored kitchen and it gave me a life long appreciation (obsession?) with homes from the era. My mother has since remodeled my childhood home, as she wishes to sell. Very sad! 3) Affordability! The Mid Century houses in our area are much more affordable (and more conveniently located) than the Newly Built Subdivisions. Also, because we bought a deceased estate with almost no updates, we got it for a good price! 4) It’s a Forever Home. It’s big enough to raise our family in right now, with a lovely big yard for the kids to play in, yet because it’s a ranch house (with a basement) it will be easy enough to maintain when we get old and mobility becomes an issue. 5) The Neighborhood. We have the BEST neighbors ever! They are a mix of newer families and original owners, and there is such a sense of community here, and neighborhood pride! When I walk around the neighborhood, you can see that a lot of people have put years of love and effort into their homes. Overall, I love our 1959 ranch house. Some people (as in, our extended family) don’t understand why my husband and I wanted an ‘old house’, but it’s perfect for us and our lifestyle! It has everything we need! We live in a mid-century house in Seattle, and I heartily agree with all of your points…except Number 5. For a typical not-yet-remodeled house, embodied energy constitutes no more than (and usually less than) 3% of the total energy the house will consume over a 50-year life span. For a longer life of course, even less. There are other excellent reasons to preserve a house (character, memories, look and feel) but embodied energy is not one of them. Mid-century houses are reaching the age where many of their bits need replacing–mechanical, plumbing, electrical, often windows and siding. It is totally possible to remodel a house and at the same time retain its character AND dramatically reduce energy use by adding insulation in attics, wall cavities and externally, replacing windows with triple-glazed European windows (which lend themselves really nicely to the large expanses of glass in Mid-C houses), sealing air leaks, adding heat-recovery ventilation, replacing oil and gas space and water heating with heat pumps, and so on. Rob — I have a broader view of ’embodied energy’ than perhaps the dictionary definition. My view of embodied energy encompasses all costs to build — or rebuild — or renovate — the house. EVERY SINGLE COST — because every single cost — including labor — requires energy, requires carbon use. So that would mean: Tear down a $200,000 (for example) house and rebuild it as a so-called “green house” for, say, $300,000 — and you must justify that incremental $300,000 in “carbon expenditures” projected over the lifetime of the house, compared with making incremental updates to the $200,000 house to begin with. I think it also depends on where you live. Our 50+ year old furnace still works, but is probably only 50% efficient, and we live in the Midwest where it gets really cold. We estimated that a new one would save $400-500 a year, and with rebates from the utility company, would pay itself off in about 6 or 7 years. (including labor) That is definitely worth it. But if you lived in, say San Diego, it probably wouldn’t be. Rachel – I think Pam’s point is that remodeling or renovating simply for the sake of being “greener” isn’t always as green as you’d think. Throwing out existing features to replace them with new stuff is NOT green. Plus the cost can take years and years to recuperate. It’s always a good idea to sit down and figure out what the actual savings are and when you’ll really being realizing them. It’s the same with buying a fuel efficient car – the sticker price of hybrids and clean diesels mean that you won’t really be seeing savings in fuel costs until you’ve driven the car for 100,000 miles or more. Will you really own the car that long? You may be better off buying a fuel efficient gas car that costs less. Similarly, will you be in your house long enough to realize the savings in new fangled, “green” technology? My oil furnace is 50 years old but it just keeps chugging along. I know a newer furnace would be more efficient (and more green) but as of right now, my heating costs are actually lower than just about everyone I know. It costs about $750 to fill the tank and that amount of fuel will last me almost all winter. It gets pretty cold here (well below freezing in January), so it definitely gets a lot of use. I’m not saying you shouldn’t get a new furnace, it’s just that you should sit down and see how long it will really take before it starts paying for itself in fuel savings. It’s not just whether you will see the savings while you’re in a house or in a car — the question is, will ANYONE ever see the savings? That is, will the new “green” product last long enough to deliver net-energy/carbon savings to justify its creation vs. just keeping the old product until it for sure wears out. Of course, all the research into green products is very good in that: If you really do need to replace something, there likely are better-researched solutions now. Plus, there are other reasons besides energy to consider a ‘green’ product — related to chemical safety and the like. I think this issue comes to the forefront very clearly with old windows. Our old hardwood windows may last another 300 years if maintained – I’m just throwing that number out there — maybe more maybe less. Put a storm on it to get as much energy savings as a new “energy efficient” window that may fail in 10 years. Explain what’s green about that. Note: Old windows may have other issues — for example, lead paint; consult with your own properly licensed pro. Another thing to consider is that our older homes were designed with certain materials in mind and don’t always respond well to new materials. Vinyl windows are one particular culprit, especially in brick or wood buildings in damp climates that need to “breathe” a little. Chances are, you’re better off replacing windows with the same type of windows that were in the house originally. Similarly, new high tech “envelope” materials (moisture barriers and siding) can wreak havoc on an older home. It’s always best to consult with someone who understands these issues – otherwise your well-meaning project could create big problems. I read the story, albeit I read it quickly. My takeaway: Old houses were “overbuilt” vs. today’s standards. That is: Old house were built better – better materials, better craftsmanship. Today’s houses — built to last 50 years. Old houses — built to last indefinitely. While I agree that every dollar spent has an ecological consequence, most worthwhile measures of embodied energy (CMHC’s Athena Impact Estimator for example http://www.athenasmi.org/our-software-data/ecocalculator/) take into account all of the carbon expenditures you mention, including labor, transportation of the workers to and from the job site during construction, transportation of the materials, etc. The figure for embodied energy remains tiny…UNTIL you reduce the energy use of a building in a major way. For Passivhaus or EnerPHit (Passive House renovation) projects that reduce heating energy by ~90% and total energy use by ~70% over 2009 International Energy Code, embodied energy is a much larger factor. Rather than simple payback (“How long will it take me to get back the money I will spend on this energy efficiency measure?”) you might look into other ways of measuring, like net present value. (“If I invest this money in an energy efficiency measure, what will my rate of return be, and how will it impact the value of my house?”) In Washington, the energy code is charged with reducing energy use in new and renovated buildings by 15% every three years. If you build a house to code today, it’ll be worth less compared to new houses in three years…and six years…and nine years. By 2030 your code-built house of today will use 3x to 4x the energy of a new house. What do you think energy prices are going to be like in 2030? You’re *probably* not going to want to renovate again in 15-20 years, why not just do it right now and be done with it? Most green renovations just go far enough to feel the pain of the expense, and not far enough to significantly reduce energy use or reap the rewards of increased durability and comfort. The windows we spec in our projects cost the same as good quality American windows, but they perform better than twice as well, with U-values of ~0.14, and solar heat gain coefficients of >0.50. The windows can actually be energy positive! As an architect who loves lots of light and sun (important in Seattle!) this is very exciting to me. My house uses about $3,000 in energy a year, between electric and natural gas. If I tore it down and rebuilt it, even with a very low energy use house like passive solar, it would cost me about…. $500,000 (okay, maybe that’s high, but my house is really well built, I have construction and materials at 1951 standards). Thus, it would take me 167 years to recoup my “investment” (assuming I am 100% off the grid with the new construction). To be sure, this calculation of mine does not take into account the inflation of energy prices annually — but it also does not take into account the money I could earn by investing that $500,000 in a couch-potato-portfolio — I will guess I would make as much as, probably more, in an indexed asset allocation fund over time — nor does it take into account the fact that most folks don’t have $500,000 cash and would have a mortgage on that money, so it would *cost* even more. Keep comin’ at me! I want to understand, I really do… And, I’m waiting for good batteries to be developed that can hold the energy created by PVs…. Well, you’ve got me there. Doing nothing will always be cheaper than doing something. In the short run, anyway. 😉 If your house is functional, comfortable and the right size for you, and everything in it works as it should, I totally agree–keep it as it is! But for many people with a 60+ year-old home with (perhaps) some years of deferred maintenance and original aluminum windows, cabinets, flooring, and plumbing, heating and electrical systems and so on, the choice is not between doing nothing and tearing down their existing house and building a completely new one. The choice is between spending (let’s say) $100,000 (to pick a number out of a hat) to renew all those systems, and (say) $130,000 to renew all those systems in a way that makes the home way more energy-efficient. The delta might not be that much, but I’m exaggerating the extra cost for effect. Let’s say you’re borrowing that money. To borrow that extra $30,000 you’ll need to come up with an additional $6,000. (20% of the 30K). If you make the right choices and you reduce your energy use smartly, you’ll get that $6,000 back in seven or eight years in reduced energy bills, and after that, it’s all gravy. Of course, all those numbers vary with each project and how expensive energy is now and will become in the future where that project is, but it’s safe to assume energy will not become *less* expensive in the future. Now, let’s say there’s more to be done–maybe an addition to accommodate a growing family (so you can stay in that cool neighborhood instead of moving!) or major modifications to make aging in place easier, *along* with all of those upgrades. Then the delta between a new house and a renovated house could narrow quite a bit, especially if some rearranging is necessary. In Seattle by the way we “deconstruct” houses rather than demolish them. 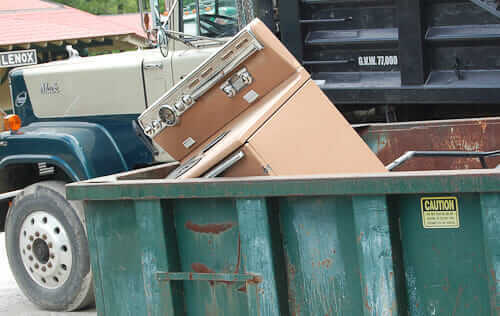 That means removing and salvaging everything that can be reused, and recycling the rest. Recycling rates are above 80%–often up to 93%. So if it turns out it makes more sense to build a new house than restore the existing one, the entire old house doesn’t get dumped in a landfill. Like you I don’t have a lot of patience with greenwashing. You can’t just slap some recycled countertops in a project and call it green. But there are worthwhile goals: Conserving water and energy are crucial now, and will become increasingly important going forward. Hi Rob, you’re still talking to me! Question: Can you share what windows you specify? I would love to know! I still will ramble-repeat: Any expenditure for which there is not a demonstrable — measurable — energy conservation savings — is burning more carbon than it will ever save and therefore, cannot be called ‘green’ in the carbon emissions sense — which seems to me to be our must urgent issue. Of course, there are other aspects of ‘green.’ But for example, a material with recycled content that costs a lot more money will have worse carbon impact, I believe — because it takes more economic activity — more carbon — to fund that purchase. So in this sense many ‘green’ products, if they cost more, are also part of the consumption that fueling climate change. Here’s an example of my hypothesis related to this idea: “Need or want a new countertop and want to choose the one that will do the least climate change damage? Go for the cheapest one. Because economic activity = carbon. This means, if you can’t find NOS at the Restore, buy laminate. DIY if possible. You had to earn less — you caused less economic activity — you caused fewer carbon emissions. Cha ching!” Again, I could be mis-thinking this… if so, let me know why! This whole topic intrigues me so! Note the FTC has guidelines on all green marketing claims, as I am sure you know — https://retrorenovation.com/2012/11/14/an-end-to-greenwashing-the-ftc-issues-new-guides-cautioning-marketers-against-making-broad-unsubstantiated-claims/. Yes, you may need to refresh systems on your house for other reasons. Of course, this burns carbon and likely has a negative environmental impact. But of course, we need to live. Me: I’ve spent a lot of money on my houses over the years. Money to “refresh” and replace and expand and… when of course, I could have “lived with.” Yes, the heating got replaced and that was a “need”. But I could have patched and repaired the 1970s kitchen, but I gut-remodeled it instead– yes, with salvaged vintage cabinets but with a lot of new stuff and a not-inexpensive contractor, too. Let’s call this all what it is: Consumption. Like I said, I am super interested in this topic! Thank you for playing with me!!!! You don’t have to recoup the rest of that $24,000 because you haven’t spent it, you’ve borrowed it. At that break-even point your monthly cost-savings in energy will pay the extra portion of your loan. (Bear in mind I’m just illustrating the principle–the actual amounts will vary with your project….) Say you’re spending $3,000/year on heating now. (Or is that all energy, including electrical and plug loads?) A deep-energy retrofit could reduce your heating needs by 80%. So your heating bill would be $50/month instead of $250. Hm, you’d get that $6,000 back in two and a half years! AND have a more comfortable house in the meantime. There are many different high-performance windows available. I’ve been using Zola Windows. For our projects that are designed specifically to take advantage of the larger sizes they can do, they’re about the same price as high-quality aluminum-clad wood American windows like Marvin, Pella or Andersen. If there were a carbon tax, then your rationale for a simple direct relationship between cost and carbon emissions would make sense. As it is, it’s more complicated than that. I refer you back to the Athena online tool. You can compare materials there. I *think* I understand what you’re saying about the energy-savings funding the loan after you “pay back” the $6,000. But — that doesn’t put you ahead. You have lost all the opportunity cost of the money for that duration of time. After the 15 years, though, yes, it seems like you would move beyond the payback period. If all these numbers really worked. Finally, I still stand behind one of my key point — economic activity=cost=carbon. Poor people do not generate much carbon dioxide equivalents. Rich people, a lot. This has nothing to do with whether there is a carbon trading market. No matter how you dice it, seems tome that consumption remains the nut of the issue. And again — if you buy a ‘green’ product that costs more money than it will save in energy cost saving, then you are adding to the problem.